Glaciers are made up of fallen snow that, over many years, compresses into large, thickened ice masses. Glaciers form when snow remains in one location long enough to transform into ice. What makes glaciers unique is their ability to move. Due to sheer mass, glaciers flow like very slow rivers. Some glaciers are as small as football fields, while others grow to be over a hundred kilometers long. Presently, glaciers occupy about 10 percent of the world's total land area, with most located in polar regions like Antarctica and Greenland. Glaciers can be thought as remnants from the last Ice Age, when ice covered nearly 32 percent of the land, and 30 percent of the oceans. An Ice Age occurs when cool temperature endure for extended periods of time, allowing polar ice to advance into lower latitudes. 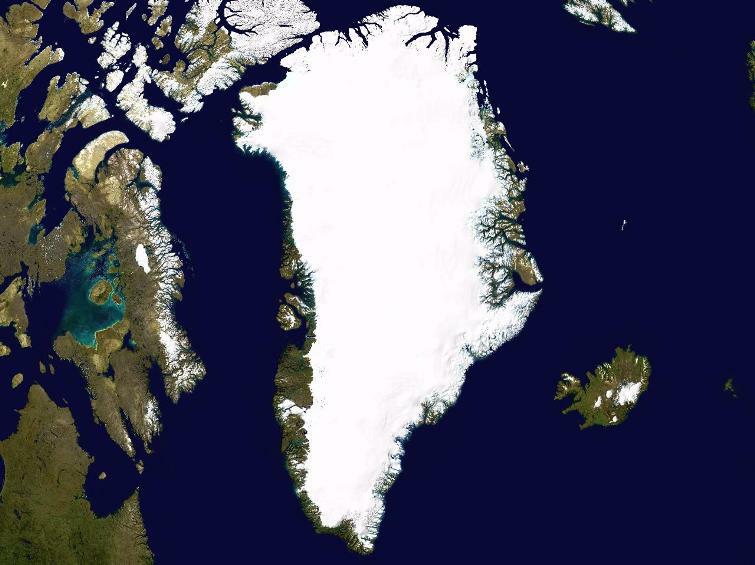 For example, during the last Ice Age, giant glacial ice sheets extended from the poles to cover most of Canada, all of New England, much of the upper Midwest, large areas of Alaska, most of Greenland, Iceland, Svalbard and other arctic islands, Scandinavia, much of Great Britain and Ireland, and the northwestern part of the former Soviet Union. Within the past 750,000 years, scientists know that there have been eight Ice Age cycles, separated by warmer periods called interglacial periods. Presently, 10% of land area is covered with glaciers. Glaciers store about 75% of the world's freshwater. Glacierized areas cover over 15,000,000 square kilometers. Antarctic ice is over 4,200 meters thick in some areas. In the United States, glaciers cover over 75,000 square kilometers, with most of the glaciers located in Alaska. During the last Ice Age, glaciers covered 32% of the total land area. If all land ice melted, sea level would rise approximately 70 meters worldwide. Glacier ice crystals can grow to be as large as baseballs. The land underneath parts of the West Antarctic Ice Sheet may be up to 2.5 kilometers below sea level, due to the weight of the ice. North America's longest glacier is the Bering Glacier in Alaska, measuring 204 kilometers long. The Kutiah Glacier in Pakistan holds the record for the fastest glacial surge. In 1953, it raced more than 12 kilometers in three months, averaging about 112 meters per day. 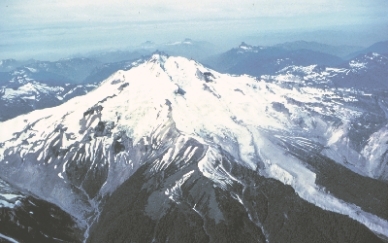 In Washington state alone, glaciers provide 470 billion gallons of water each summer. 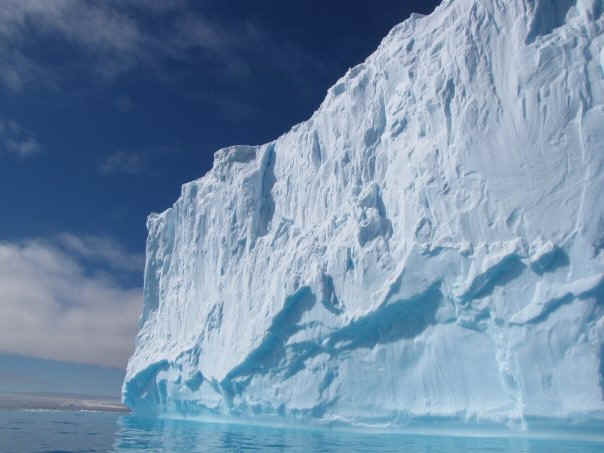 Antarctic ice shelves may calve icebergs that are over 80 kilometers long. Almost 90% of an iceberg is below water--only about 10% shows above water. The Antarctic ice sheet has been in existence for at least 40 million years. From the 17th century to the late 19th century, the world experienced a "Little Ice Age," when temperatures were consistently cool enough for significant glacier advances. Ice sheets and glaciers form the largest component of perennial ice on Earth. Over 75% of the world's fresh water is presently locked up in these frozen reservoirs. A Glacier is any large mass of perennial ice that originates on land by the recrystallization of snow or other forms of solid precipitation and that shows evidence of past or present flow. A glacier occupying an extensive tract of relatively level land and exhibiting flow from the center outward is commonly called an ice sheet. Glaciers form when snow accumulates on a patch of land over tens to hundreds of years. The snow eventually becomes so thick that it collapses under its own weight and forms dense glacial ice. When enough of the ice is compacted together it succumbs to gravity and begins to flow downhill or spread out across flat lands. What makes glaciers unique is their ability to move. Due to sheer mass, glaciers flow like very slow rivers. More than 90 percent of the 33 million cubic kilometers of glacier ice in the world is locked up in the gigantic Greenland and Antarctic ice sheets. Most of the world's glaciers are found near the Poles, but glaciers exist on all of the world's continents, even Africa. Australia doesn't have any glaciers; however, it is considered part of Oceania, which includes several Pacific island chains and the large islands of Papua New Guinea and New Zealand. Both of these islands have glaciers. Glaciers require very specific climatic conditions. Most are found in regions of high snowfall in winter and cool temperatures in summer. These conditions ensure that the snow that accumulates in the winter isn't lost (by melt, evaporation, or calving) during the summer. Such conditions typically prevail in polar and high alpine regions. There are two main types of glaciers: valley glaciers and continental glaciers (known as ice sheets). The amount of precipitation (whether in the form of snowfall, freezing rain, avalanches, or wind-drifted snow) is important to glacier survival. In areas such as Antarctica, where the low temperatures are ideal for glacier growth, very low annual precipitation causes the glaciers to grow very slowly. Motion and change define a glacier's life. Glacial ice advances, then retreats. Glaciers grow and shrink in response to changing climate. Ice sheets form in areas where snow that falls in winter does not melt entirely over the summer. Over thousands of years, the layers of snow pile up into thick masses of ice, growing thicker and denser as the weight of new snow and ice layers compresses the older layers. Ice sheets are constantly in motion, slowly flowing downhill under their own weight. Near the coast, most of the ice moves through relatively fast-moving outlets called ice streams, glaciers, and ice shelves. As long as an ice sheet accumulates the same mass of snow as it loses to the sea, it remains stable. In addition, the layers of ice blanketing Greenland and Antarctica contain a unique record of Earth’s climate history. 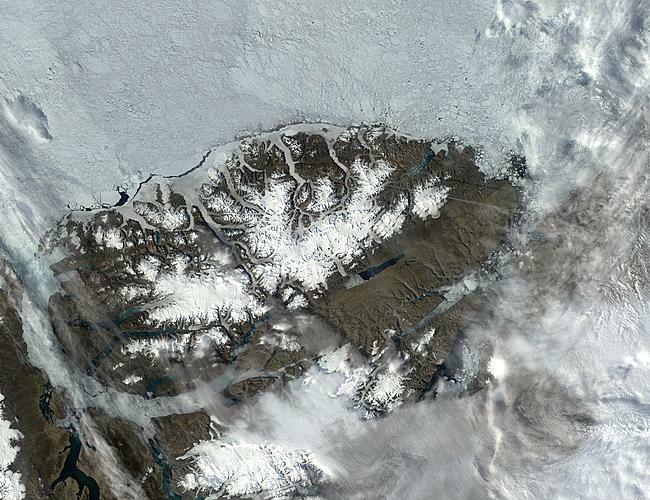 The mass of ice in the Greenland Ice Sheet has begun to decline. 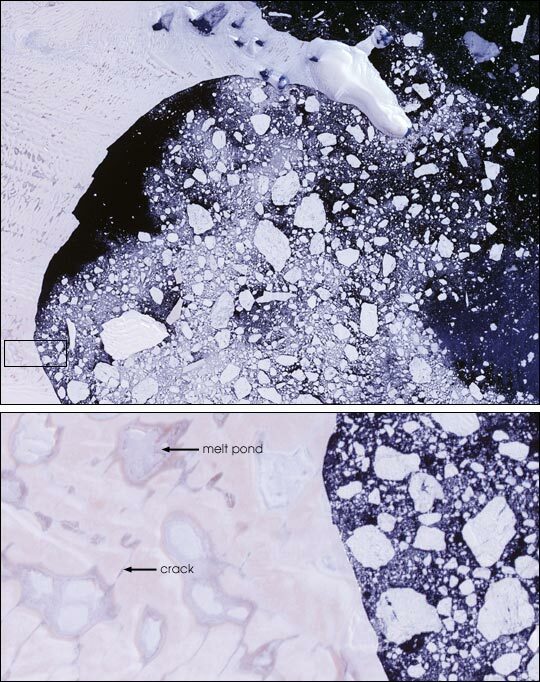 From 1979 to 2006, summer melt on the ice sheet increased by 30 percent, reaching a new record in 2007. At higher elevations, an increase in winter snow accumulation has partially offset the melt. However, the decline continues to outpace accumulation because warmer temperatures have led to increased melt and faster glacier movement at the island's edges. 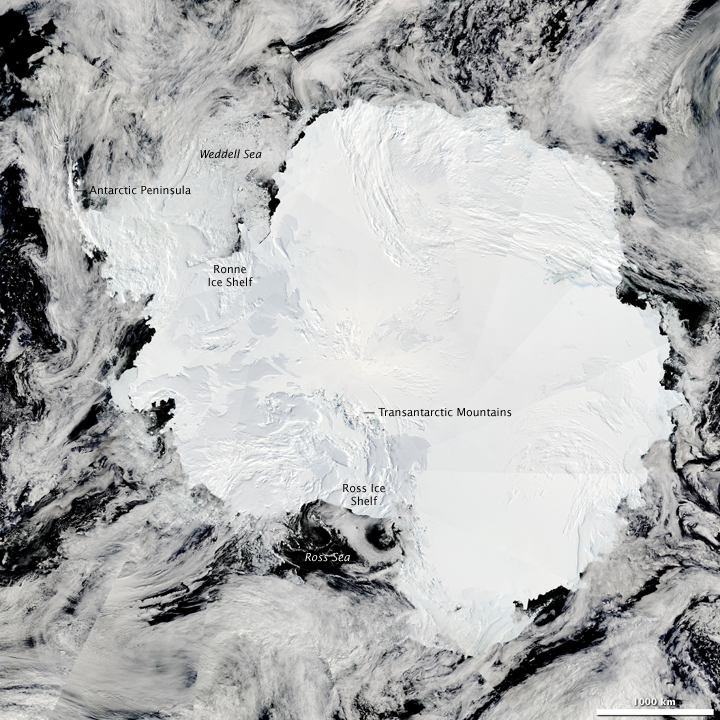 Most of the world’s ice shelves hug the coast of Antarctica. However, ice shelves can also form wherever ice flows from land into cold ocean waters, including some glaciers in the Northern Hemisphere. 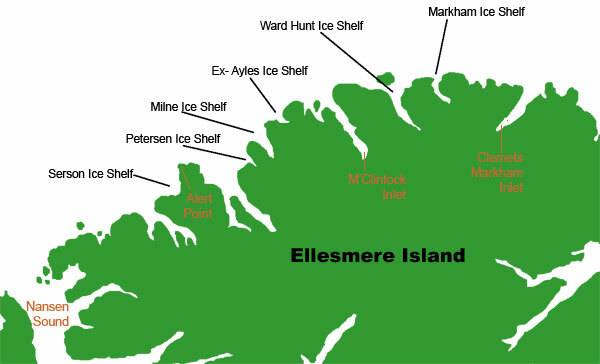 The northern coast of Canada's Ellesmere Island is home to several well-known ice shelves, among them the Markham and the Ward Hunt ice shelves. In recent years, ice shelves on the Antarctic Peninsula and along the northern coast of Canada have experienced rapid disintegration. In March 2008, the Wilkins Ice Shelf in Antarctica retreated by nearly 1,100 square kilometers (425 square miles). Later that summer, several ice shelves along Ellesmere Island in Northern Canada broke up in a matter of days. In contrast, the collapses in previous years happened over a period of weeks, leaving a soup of chunky ice and small icebergs. The remaining ice shelves retreated by as much as 90 percent, and several have experienced repeated collapses. Scientists attributed rapid ice shelf collapse to warmer air and water temperatures, as well asincreased melt on the ice shelf surface. Retreating sea ice may also play a role. 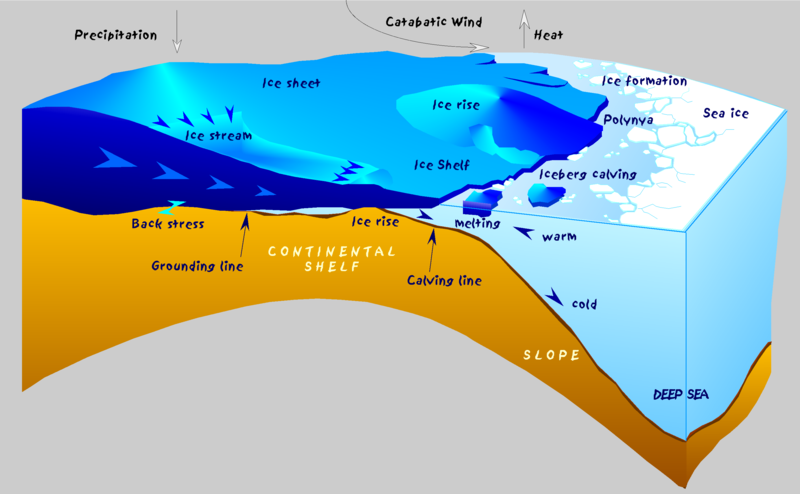 Ice shelves occur when ice sheets extend over the sea, floating on the water. In thickness they range from a few hundred meters to over 1000 meters. Ice shelves surround nearly all of the Antarctic continent. 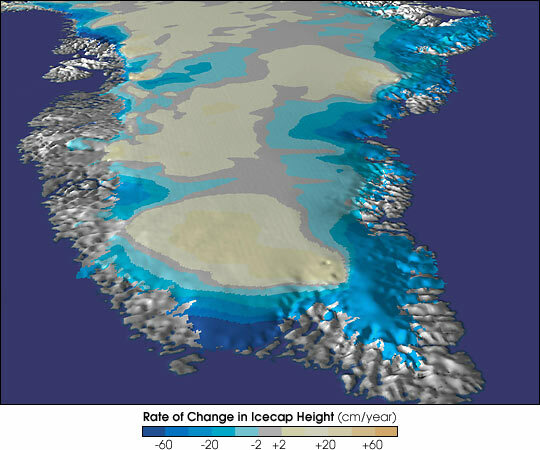 Retreating ice shelves may provide indications of climate change. Ice caps are miniature ice sheets. An ice cap covers less than 50,000 square kilometers. They form primarily in polar and sub-polar regions that are relatively flat and high in elevation. These glaciers develop in high mountainous regions, often flowing out of icefields that span several peaks or even a mountain range. The largest mountain glaciers are found in Arctic Canada, Alaska, the Andes in South America, the Himalayas in Asia, and on Antarctica. Commonly originating from mountain glaciers or ice fields, these glaciers spill down valleys, looking much like giant tongues. Valley glaciers may be very long, often flowing down beyond the snow line, sometimes reaching sea level. The calving terminus of Tyndall Glacier, located at the head of Taan Fiord, Icy Bay, Wrangell - St. Elias National Park, Alaska. The large mountain to the right is Mt. St. Elias. A glacier with a terminus that ends in a body of water (river, lake, ocean) into which it calves icebergs. 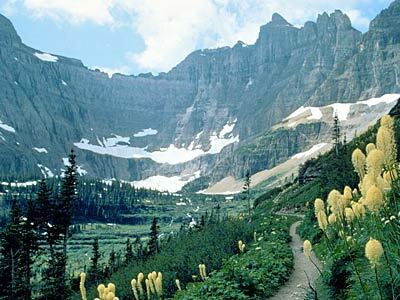 Piedmont glaciers occur when steep valley glaciers spill into relatively flat plains, where they spread out into bulb-like lobes. 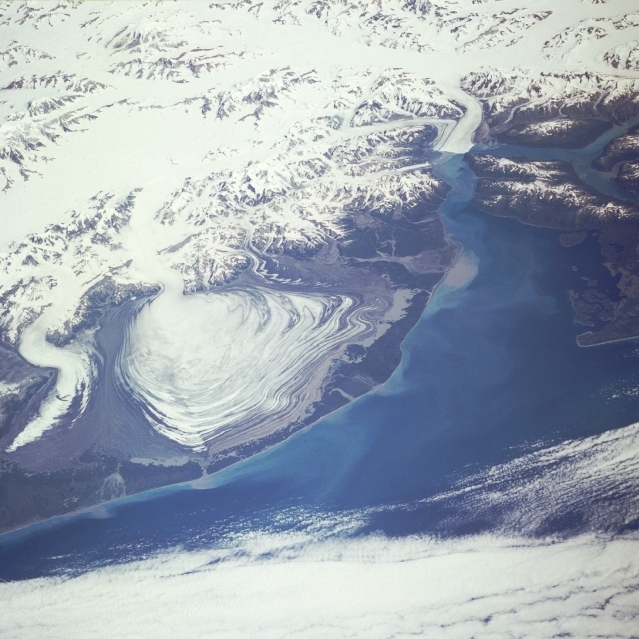 The Malaspina Glacier in Alaska, covering over 5,000 square kilometers is one of the most famous examples of this type of glacier. Cirque Glaciers are named for the bowl-like hollows they occupy, which are called cirques. Typically, they are found high on mountainsides and tend to be wide rather than long. North-looking oblique aerial photograph showing a small, unnamed hanging glacier located in the Chugach Mountains, near Cordova Peak, Chugach National Forest, Alaska. Also called ice aprons, these glaciers cling to steep mountainsides. Like cirque glaciers, they are wider than they are long. Hanging glaciers are common in the Alps, where they often cause avalanches due to the steep inclines they occupy. A glacier formed below the terminus of a hanging glacier by the accumulation, and reconstitution by pressure melting (regelation), of ice blocks that have fallen and/or avalanched from the terminus of the hanging glacier. Also called Glacier Remanié. A glacier-like landform that often heads in a cirque and consists of a valley-filling accumulation of angular rock blocks. Rock glaciers have little or no visible ice at the surface. 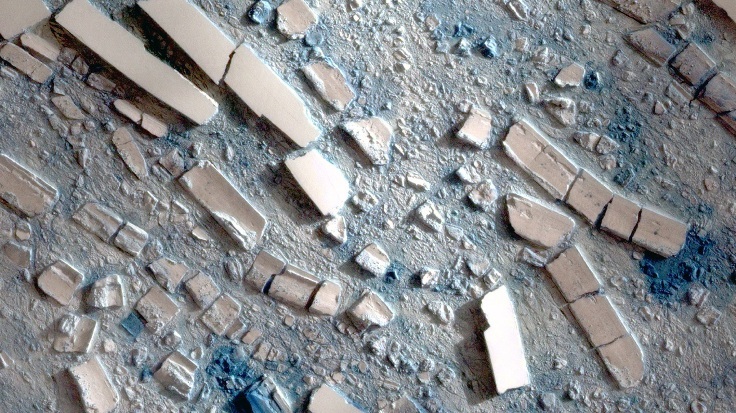 Ice may fill the spaces between rock blocks. Some rock glaciers move, although very slowly. As the name implies, these are valley glaciers that flow far enough to reach out into the sea. Tidewater glaciers are responsible for calving numerous small icebergs, while not as imposing as Antarctic icebergs, can still pose problems for shipping lanes. 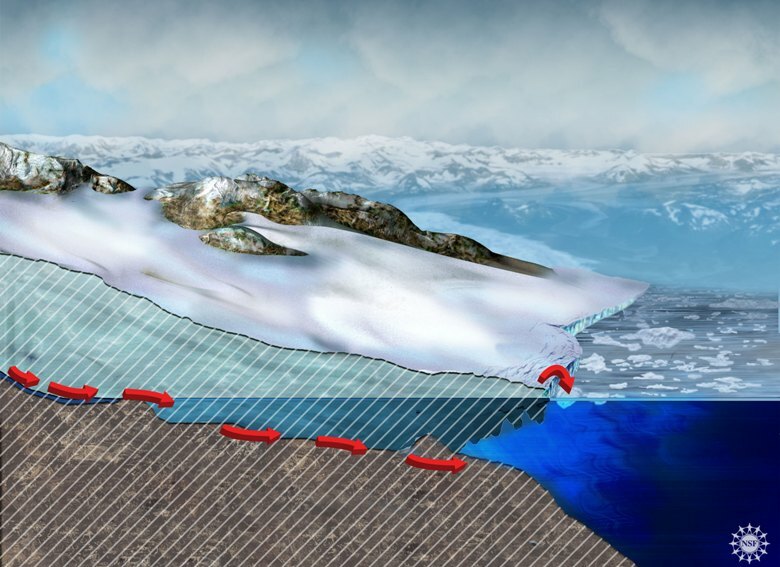 When a glacier with its "toe in the water" thins, a larger fraction of its weight is supported by water and it slides faster and calves more ice into the ocean at the glacier terminus. Polar ice reflects a great deal of the Sun's energy that falls on it back into space, helping regulate the amount of energy arriving on Earth, which drives weather and all the other atmospheric activities. Even a few percent more acres of open water absorbing energy could tip the scales of Earth's energy balance, adding more energy to the atmosphere, altering short- and long-term weather patterns.